Again, I LOVE these mini-arcs. Tonight I watched the whole Vulcan Reformation arc in one sitting and it was pretty awesome. The Vulcan embassy on Earth is bombed and a splinter sect of Vulcans are apparently to blame. Archer and T'Pol head to the Vulcan desert (which is pretty much the whole planet) to track them down and, while they're wandering around some craziness happens and Archer gets Surak's (yes the Surak) katra lodged in his brain pan. 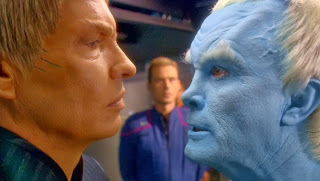 Meanwhile, Trip's been left in charge of the Enterprise while Archer's away and he has to deal with a whole mess of conspiracy, the Vulcan ambassador, Soval, and some pissed off Andorians. I really love this whole series of episodes. It perfectly sets up the change in Vulcan attitudes that happens between Archer's time and Kirk's. It gives us more insight into Vulcan history, religion, and the practices that we're all so familiar with--the mindmeld isn't so uncommon among these renegade, desert dwellers--and we get a good look at a planet that's always talked about but rarely visited. Additionally, we get a nod to stuff/people that we know well from the previous series. T'Pau is a more fleshed-out character, Surak is more than just a religious figurehead, the terms "katra" and "idic" are brought back and explained with more depth. And, of course, it's an Archer/T'Pol BFF fieldtrip episode and I always love those. This whole thing only takes three episodes but it's full to the gills of clever lines, surprising character moves, and interesting nods to the rest of Trek. Like the Vulcan inner eyelid reference. Me too! I love that! I don't recall anyone mentioning that since Operation Annihilate! T'POL: This site is called Gateway, where Surak supposedly began his journey into the Forge. ARCHER: You keep saying supposedly. You don't believe Surak did the things they said he did? T'POL: He brought logic to Vulcan, in an age we call the Time of Awakening, but his writings from that period no longer exist. ARCHER: Let me guess. With the originals lost, whatever's left is open to interpretation. ARCHER: I find it familiar. We should get moving.